TBVerifier.dll intrusively pops-up everytime Windows boots-up and displays on screen with a dropdown box labeled “RunDLL”… “. Thereupon, TBVerifier.dll dropdown box states that there was a problem starting C:\Program Files (x86)\Conduit\CT2998365\plugins\TBVerifi… The specified module could not be found. Generally, the DLLs are referred to so-called Dynamic Link Libraries (DLL)s, essentially the same as EXEs but they are not directly executable. A DLL has its own functions, classes, variables, UIs and resources (such as icons, images, files, …) that an EXE, or other DLL uses. A program loads a DLL at startup, via the Win32 API LoadLibrary. Therefore, if a program is corrupted or attacked by virus, this possibly contributes to computer problematic. And then DLL Error just like TBVerifier.dll would pop-up to report the existent trouble. A mass of computer users are frustrated about removing TBVerifier.dll error. 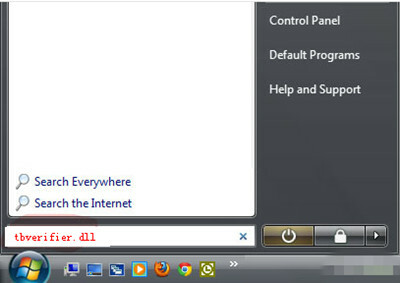 Typically, the TBVerifier.dll error is associated with Search.conduit.com redirect virus and Search conduit toolbar browser hijacker. A myriad of online computer users ever are attacked by Search conduit security threats. Although they have removed virus from computer, the TBVerifier.dll error still keeps popping-up to inform their computers is problematic and interfere with Windows reboot normally. From this point, if the conduit virus has corrupted program or makes it abnormally functioned, its relating TBVerifier.dll would pop-up. 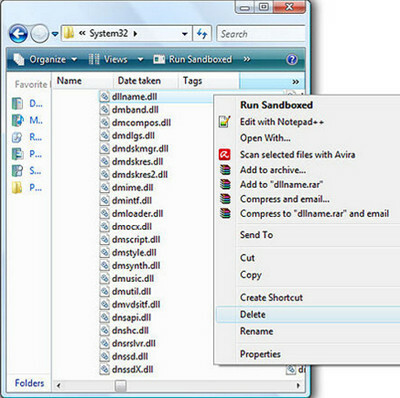 The TBverifier.dll error alert mentioned on screen is included into Conduit Toolbar malware, which may compromise computer users’ web browsers and intrusively reroute them to Search.conduit.com redirect site (If you still suffer from attacking of Search.conduit.com browser hijacker virus and want to remove it completely, click here). Even more, such virus still allow hijacker stealing confidential data for participating in illegal commercial activities. 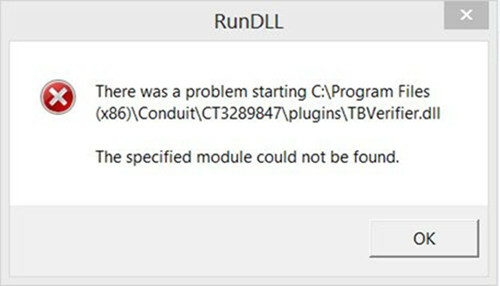 If a RunDLL error saying that TBVerifier.dll module could not be found is shown on the screen of the PC, this aims at the computer may be attacked with conduit Malware. Note: In case of further damages on the problematic computer, you’d better fix the awful TBVerifier.dll error quickly. You may ask for professional help by Live Chat with VilmaTech Online Experts. 1. Click on the Start menu at the left bottom of the screen on the desktop. For Windows 8 users, navigate to the Start menu, you can try this way. 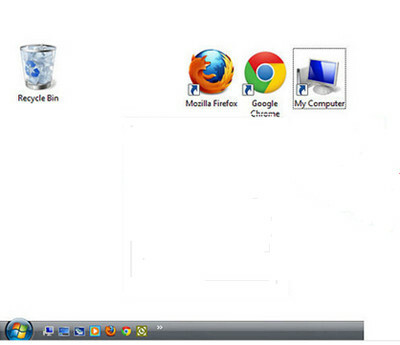 When you see the desktop, just move the mouse cursor around on the Start screen to reveal a new Apps button. 2. Click on “Search” in the menu or search bar. Choose All Files and Folders. Type the name of the TBVerifier.dll into search field. And then click on Search or hit enter key. 4. Back up the TBVerifier.dll file you are going to delete, in case of any mistaken deletion. Trace the file path of the TBVerifier.dll file to find its location. 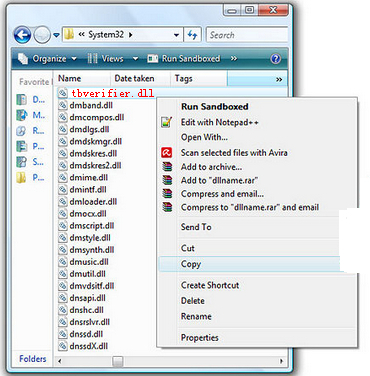 Right-click on the TBVerifier.dll file and click on the Copy option. 5. Decide where you save the TBVerifier.dll file and then click on Paste. It is recommended that you put USB Flash drive. 7. Right-click the target dll file and select “Delete.” The dll file should now be in your Recycle Bin. Note: If you never experienced with tech skills and are not confident of operating each step it is not strongly recommended you delete any dill files by yourself. You can use VilmaTech Online Service.